Like many self-respecting technology professionals, I wear a Casio Databank watch. In my case, it's the Databank 150. And when the battery conks out, you'd think that it was time to visit the local jeweler's or K-Mart service desk to get the battery replaced. You can do this, but only do it to watch the look of horror that appears when you hand them the Databank. "Oh, no, we can't service those. You need to send it in to the factory!" Clearly they have been advised by legal personnel of the ramifications of losing the customer's data. However, like many self-respecting technology professionals, I don't actually keep any information in my Databank. Those teeny keys are just too small to work with, and it doesn't sync with my computer's address book. What I find handy is the calculator function, which has proven useful on many occasions. Anyway, you'd think that since the Databank is the choice of so many technology professionals, a quick web search would turn up instructions on how to change the battery. Nope. All we get is this review [2011 update: even that has been removed], with a URL that manages to exceed 256 characters. Note that this guy doesn't keep any information in his Databank either. Disclaimer: following these instructions may render your watch useless. These instructions may be incorrect. I may be making them up as I go along. I will not be held responsible for you breaking your watch because you followed some instructions someone posted on the internet. So on with the gory details. Toss aside your warranty, grab your jeweler's screwdriver, and unscrew the four tiny screws on the back. Lift the rear plate off gently so as not to disturb the waterproofing rubber gasket. Oops, too late. Well, do your best to stick it back in on reassembly. Remove the white plastic component protector gently, and you're looking at the battery. The battery is held in place by a retainer that goes over the battery, heads down, and is kept in place by a plastic catch (see arrow). Unhook the metal retainer by pushing down and out on the retainer with your jeweler's screwdriver, and the retainer will pop loose from over the plastic catch. To clarify: you are unhooking the metal retainer from where the plastic catch is holding it in place. This is a delicate operation; don't push too hard or you'll ruin the retainer. Then remove the CR2016 battery and replace it with a new one. Here's an ASCII diagram, side view, of the retainer and catch. The plastic catch is the "o". Or it may just be an ASCII picture of a buffalo. Reassemble and you're ready to go. And even though I proudly wear a Casio Databank watch, it does not necessarily mean that I am interested in your watch. I'll say this as politely as I can: I've shared these instructions with you freely. I've posted as much as I know. Please do not contact me to ask questions about Databank watches. Thanks! Permalink Submitted by clark (not verified) on Wed, 2008-02-13 13:46. Permalink Submitted by clark (not verified) on Wed, 2008-02-13 14:10.
that did the trick. worked like a charm. couldn't have done it without this site. I am thankful for not having to go to a jeweler! :)Cheers to the Databank 150 community! Permalink Submitted by gbrow (not verified) on Sat, 2010-09-04 17:14. Thanks! The push pin method finally worked for me. It took me a while, but it worked. Permalink Submitted by Sheila (not verified) on Fri, 2012-05-11 18:53. Thanks. Between the photo/directions and the suggestion for a paper clip, I managed it! Permalink Submitted by TP (not verified) on Wed, 2012-09-05 16:22. The type of retaining clip in this watch is probably similar to other Casio watches. The original post has a good picture to identify which end of the retaining clip will pop out (open) and which end acts like a hinge (please leave this end alone). Permalink Submitted by Brandon (not verified) on Mon, 2008-02-25 06:34. Thanks for the directions. I didn't seem to have trouble following your instructions (down being...well...down, and out being away from the battery). I appreciate your post. I will not be sueing you. Permalink Submitted by Anonymous (not verified) on Wed, 2008-03-26 20:30. Does anyone know why the sound would stop after the battery on my Casio Databank 150 was replaced? Everything else works. There's just NO sound such as when I set the alarm. Also, would anyone know where I can locate a diagram of the internal structures of this Casio watch? Any help would be appreciated. Permalink Submitted by Rich (not verified) on Thu, 2008-04-03 22:31. Again, not specific to this watch model. Just a general observation. Permalink Submitted by indnajns (not verified) on Wed, 2008-05-14 11:47. If your databank is like mine (DB-35H), there is a TINY spring in a really unusual spot that you probably didn't notice that fell out. Laying the watch face down and with the back off, there is a little tiny hole in the back towards one of the corners. (sorry, already put my watch back together and didn't notice which corner.) There is a tiny (1/16" x 1/4") spring that sits upright in that hole. It must make a contact with the metal cover. I replaced my battery and when I did, a spring fell out. I looked all over the internet, then wrote Casio, who said they didn't have access to the information about where the spring went. (Doh!) I got a used DB-35H from my brother and was going to swap the innards when I noticed the spring on his. Put my spring back and it beeps! If you've lost the spring, don't know if you can fake it with tinfoil or not, but it really is a TINY spring. Good luck. Permalink Submitted by Anonymous (not verified) on Tue, 2009-07-14 08:47.
thanks, you've saved me a lot of time by telling me it was the spring that caused to watch to beep...i'm really grateful! Permalink Submitted by Richard (not verified) on Tue, 2010-12-07 11:20. Some units have a bare spot for the spring to contact the back only in one orientation. If you put the back on turned 180 deg from where it was, the beep will not work. Take the back off and turn it around so that the spring can contact the metal part of the back, not the insulated part. Then the beep should work. YMMV. Permalink Submitted by Gammerz (not verified) on Thu, 2013-12-05 14:07. @Richard: Thanks for that "no-sound" fix - worked for me. Noticed that the writing on the back of the case should be the right way up with respect to the front of the watch. They should make the screw positions asymmetrical so this mistake cannot be made. Can anyone recommend a modern watch with lots of schedule alarms with messages, that doesn't need re-charging nor a mobile phone interface, as these old watches are difficult to get hold of? Permalink Submitted by AROD (not verified) on Sun, 2009-03-15 17:52. Its manual can still be downloaded from the Casio site: look for module 2296. A lot of questions can be answered by looking at the manual. Permalink Submitted by John on Sun, 2009-03-15 20:44. Permalink Submitted by Keith Brinton (not verified) on Wed, 2016-06-15 22:59. 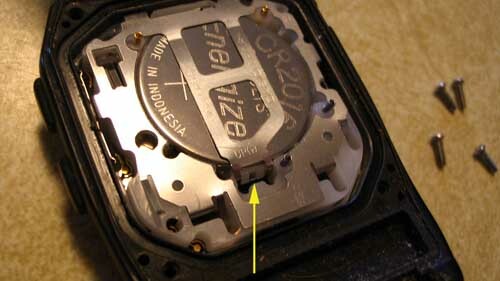 The near-microscopic spring which sticks out of the watch works and presses against the metal backplate is easily lost. It is what make the beeping sound. If you're working on the watch, and turn it upside-down to see the watch face, you can lose this spring. I think a watch place could easily replace it. Permalink Submitted by Anonymous (not verified) on Fri, 2008-04-11 14:01. I tried to figure out how to get that band off the top of the battery for a half hour and couldn't do it. Then I searched the web for 15 minutes before I found your page. THANK YOU! You saved my watch. Permalink Submitted by Mark (not verified) on Mon, 2008-04-28 19:05. Permalink Submitted by John Clifton (not verified) on Tue, 2008-06-03 13:39. Thanks for your help. Just taken my watch apart to see that it is a standard CR2016 battery that I can replace myself for a couple of pounds - not £15 that the jewellerwas about to charge me/rip me off! Permalink Submitted by Anonymous (not verified) on Tue, 2008-06-17 21:36. Before finding the extremely helpful diagram for replacing the battery of my Casio Databank, I struggled opening the cage and consequently damaged and then lost one of the springs (coils) that apparently makes the sound. Does anyone know where I can either get a replacement spring OR what I can use to substitute it so that the alarm will work again. I use the alarm to remind me to take medication and keep missing my scheduled times without it - and I'd hate to replace the watch because of a spring! Please help - preferably with a picture, photo, diagram of where these "springs" need to go for the sound/alarm to work. Thanks. Permalink Submitted by Anonymous (not verified) on Sun, 2008-07-06 21:38. Your detailed description of how that battery clip works was just what I needed. I used a tiny flat blade screwdriver "down and out" - it popped open after about 3 tries. Permalink Submitted by Anonymous (not verified) on Wed, 2008-08-13 03:28. Glad to know I wasn't imagining things when the alarm on my watch became very, very quiet after a jeweler replaced the battery. I've worn out a lot of Casio Databanks in the past couple decades--usually the case or the band breaks. Now I have a reason to keep the old ones--for their springs. Permalink Submitted by Anonymous (not verified) on Mon, 2008-08-18 15:08. Permalink Submitted by Anonymous (not verified) on Fri, 2010-09-03 14:27. Button Beep: this is covered in the manual. Go to calculator mode, then press the Set button in the upper left to toggle. Permalink Submitted by Anonymous (not verified) on Sun, 2008-08-31 10:13. Thank you for a pretty picture of the back of my Casio before I growled at it, threatened to withdraw its food supply and put it to bed without an alarm to keep it comfortable. All of which worked when the retainer flange (nice word that) holding the battery let go with a satisfying pop and the battery flew out. No plastic tweezers, no little springs stuck to the ceiling, no connecting positive to negative. In fact no previous knowledge whatsoever other than the wish of a Scotsman to deny the "professionals" (another funny word) their pound of gilded flesh. Popped in the battery, popped on the back and hey presto! Anyone want to know the time? Oh and...thank you. Be brave mon braves. Permalink Submitted by Anonymous (not verified) on Mon, 2008-12-01 21:58. My life is run by this watch. I couldn't go a day without it. I know. I need to get a life. I have a life - and it's run by this watch. Thanks a million for the instructions. I just had a jeweler replace the battery. It cost me $27.00. Can I get the battery cheaper? My husband is very mechanical (a guitar maker). If I can find the battery cheap, he can replace it next time. The jeweler did give me a five year warranty so if you think about it the battery didn't cost that much. Thanks. Permalink Submitted by vic (not verified) on Tue, 2008-12-02 16:54. Thank you, this saves my databank from being ruined. Permalink Submitted by Anonymous (not verified) on Sun, 2008-12-14 19:47. Thank you, worked like a charm on my casio waveceptor. Permalink Submitted by Ben (not verified) on Tue, 2009-02-17 14:12. How do you stop the watch from beeping when you press the buttons? Permalink Submitted by Anonymous (not verified) on Tue, 2009-10-20 16:42. Permalink Submitted by saka (not verified) on Tue, 2009-02-17 15:01. For those wondering how to stop the battery from beeping... if you examine the watch carefully, there is a thin flap of metal that pokes through the white plastic cover that you remove. This strip is meant to contact the back of the watch, where the crystals that Rich mentioned are bonded to the back. You can see the spring flap along the corner directly left of the yellow arrow in the picture. Permalink Submitted by Gammerz (not verified) on Thu, 2013-12-05 14:12. Or as Richard described, put the back-plate on upside down, then you can easily reorientate it if you need the sound again. Permalink Submitted by Anonymous (not verified) on Sun, 2009-02-22 20:27. This battery change procedure works for the databank telememo 30 as well. I've had this watch for over 10 years and never changed the battery until now. The battery I found inside was a Li 3 volt Sony CR2016. Permalink Submitted by croozer (not verified) on Mon, 2009-02-23 13:00. I can't live without this watch (it's my third Databank) and the battery only lasts about a year because I use it so much. I replace the batteries myself in all my other watches, but couldn't do this one. Thanks to you, I can now save $7.50 each time. Plus, I bought a five-pack of 2016 Lithium cells for a buck, so you've saved me nearly $40. Thank you thank you thank you! Permalink Submitted by Anonymous (not verified) on Tue, 2009-02-24 08:46. I just replaced my watch battery last night. Wish I had found this website first, because it would've saved me about 20 minutes. My watch however, is now displaying the message "OPEN" at the top and the watch does not respond when I press any of the buttons. The time is displayed in the lower area. Any ideas why this is happening? Permalink Submitted by Anonymous (not verified) on Wed, 2009-02-25 19:04.
hi tanx for this post about the databank 150...well i got the same problem on my watch...it displays OPEN at the top,and some kind of a square i dont know what to do please help! Permalink Submitted by Anonymous (not verified) on Fri, 2009-02-27 19:44. I recently went to a local Batteries+ store to have a nicad pack rebuilt and noticed that they also offered watch battery replacement. After 5 years of continuous operation my Databank 150 was still keeping time, sounding a daily alarm and updating from WWVB every night but the backlight was no longer working. Of course none of the buttons would make a difference and I asked if he had used a tweezer to reset the AC as outlined in the manual. He invited me to come back to his bench where he opened the case and showed me the message inside indicating that AC and a marking "(-)" should be held for two seconds and then it would work. Several attempts on his part and then mine proved useless. The store owner was afraid he'd cooked my watch and didn't charge for the new battery. Meanwhile, I had a useless joke with Open and the wrong time on my wrist for the rest of the day. Not giving up so easily, when I got home that night I made a concerted effort to resolve the problem and found this blog. I cleaned the contact points on the piezo crystal and case interior where the finger and spiral springs make contact and performed the AC jumper connect again. I turned the plastic inner shell so the slot allowed the finger spring to stick up and reassembled the case again. No joy. Open would not go away despite several attempts to repeat and reseat the works. As a last resort, I decided to leave out the plastic inner shell and reassemble without it. Much to my surprise the watch sprang back into nearl normal operation! All regular functions worked, the beep was loud & clear, all stored memories were stillintact and the backlight works as before. Yay! The only anomaly I noticed was that pressing the Receive button would neither indicate the last radio update or initiate an update when held-in. Fearing the loss of the radio, I manually set the time and went to bed. The next morning I checked and saw the little sat dish icon indicating that it had successfully performed an automatic update that night. Whew! I'm not sure whether the button failed before or after the battery change because I could even recall the last time I had used it. I'm still not certain why the Open message was so hard to overcome but my gut feeling is that the plastic inner shell may be the part requiring precise alignment before replacing the back cover. In any case, I've decided to leave well enough alone as it seems fine as is. I hope this has been helpful to anyone has had the same problem. Permalink Submitted by Anonymous (not verified) on Sat, 2009-02-28 10:54. As it turns out, the Receive button -does- serve another important function: It toggles the daily and hourly alarm modes. Once activated, the daily alarm will continue to do so unless turned-off by the Receive button in alarm mode. So I delved back into the 150 problem in another effort to further diagnose the problem. Attempting to replace the plastic inner cover only brought back the Open message. This inner cover has two holes: a slot and a round hole. On my post-battery replaced watch, two tiny coiled springs stick up from the watch inner frame: a steel spring that protrudes through the round hole and a copper spring that is apparently compressed by the plastic cover. The plastic cover has a brass strip on the inside top edge. The copper spring makes contact with one end of this strip, but it is the only point of contact. It seems that this strip is actually an electrical bridge that is intended to complete a vital circuit and that by taking out the plastic cover the copper spring makes contact with the case and allows the watch to exit Open mode and -appear- to function. This was confirmed by jumpering the copper spring to the adjacent steel structure covering the frame and seeing Open revert to the correct time again. My best guess at this point is that there was originally a third coiled spring that completed this path from the brass strip back to the Receive button and that it sprung out and was lost when the dealer first attempted to change the battery. Looking closely at the mount points on the watch frame, I see that the steel and copper springs both have a slightly elevated circle in the white polyethylene plastic and that there is another (empty) hole where a matching spring would make contact with the other end of the brass strip. A further test confirmed this by jumpering the remaining copper spring with a tweezer poked into the other hole. When bridged in this manner, the watch returned to normal time mode and (more importantly) allows switching to alarm mode and changing of the alarm function via the Receive button. I am fairly sure that this also would allow the Receive button to either display the last update time or initiate an update if held in. So in conclusion, I'm fairly certain that this watch needs the three coil and finger springs intact and making proper contact for the watch to function correctly. Referring back to an earlier blog entry, has anyone with this problem had any luck in finding suitable replacements for these coil springs? Permalink Submitted by Donald (not verified) on Tue, 2016-01-05 22:47. Replacing the battery on my Casio e-databank and couldn't figure out why it wouldn't get out of open mode. I now have my trusty databank back in action! Permalink Submitted by Wayne A. (not verified) on Wed, 2009-03-25 20:03. Thank you for information. Replacing the battery myself was much more economical than paying 4X the cost of a battery to have someone else do it. Permalink Submitted by Tom (not verified) on Sun, 2009-04-05 21:13. Thanks for this. The 150 appears to be working OK after the battery replacement. I performed the AC procedure, and wonder what this is intended to do since there was no response from the watch. Permalink Submitted by Chuck H (not verified) on Mon, 2009-06-15 14:42. What is the AC procedure? There is a little hole with a contact down in there by the AC mark on the retainer ring. Are these points susposed to be jumpered for 2 seconds? Permalink Submitted by mike Indiana (not verified) on Mon, 2009-05-18 18:59. Oh my GOD i did it, I fixed the Alarm. yes, you have to contact the AC (all clear) to the (+) to reset the watch, but if that super super tiny spring pops out, that connects the negative end of the batter to the piezoelectric crystal on the back case of the watch, then your alarm doesn't work. Odds are you won't even see the spring it's so tiny, but the alarm won't work without it. Thanks for Rich's comment about the piezoelectric crystals on the metal back of the watch, that was the clue I needed. the Piezo crystal on the back of the watch has two contacts, one looks like bare metal, the other is a kind of film or looks like tape, the spring makes contact with the bare metal and a piece sticking up makes contact with the other terminal of the crystal. I substituted a very tiny snip of wire down in the hole where the spring goes and VIOLA! IT WORKED!! I NEVER would have figured that out without reading all these comments, thanks a bunch. Permalink Submitted by Anonymous (not verified) on Sun, 2009-06-14 21:22. Reolaced the bat. Did not lose any of the three spring. Cleaned up the connections on the copper bridge on the cover, made sure the tap was making contact with the cover through the plastic deal. Light works, the receive button will cycle betwee the signal disply and the time mode, but pushing "B" to change modes has does nothing. I am not sure I got that 2 sec. jumper betwee AC and - right. Had to put a pin down into that little hole and try to connect with the retainer ring. Is that right? Still can't change the mode. Permalink Submitted by Anonymous (not verified) on Sat, 2009-06-20 15:51. I couldn't get the tab to free up on my wave ceptor so I slid the battery out to the bottom after removing the silver spring people seem to lose. Before the battery was all the way out, I slid the new one carefully underneath. It worked for me, maybe it will work for you. Good luck, watch is still working. I will say I've gotten two comments in the last week, one from a young punk surgeon-Geek, and another from a patient-that watch must be over 15 years old-Well, it takes a licking and keep on ticking- still functional and exceptional just like me. Permalink Submitted by Doc (not verified) on Sat, 2009-06-20 15:54. I will say I've gotten two comments in the last week, one from a young punk surgeon-"Geek," and another from a patient-"that watch must be over 15 years old"-Well, it takes a licking and keep on ticking- still functional and exceptional just like me. Permalink Submitted by Anonymous (not verified) on Thu, 2009-07-30 19:17. THANK YOU, LAST TIME I TOOK IT TO WALMART AND THEY SCREWED UP MY WATCH. READING YOUR STEPS HELPED ME CHANGE MY OWN BATTERY. Permalink Submitted by Joe (not verified) on Thu, 2009-09-03 16:46. Thanks for the advise , I finally fix my watch I forget it for a year because of the OPEN display, reset it by bridge the AC point with the battery+, put the back, and in 3 seconds again the <>OPEN display, then read again this blog, the springs were all in their place but noticed that the inner face of the backplate had some yellow stains, maybe dried sweat, clean it up, reset, close, watch went to WAIT mode, screw it (I mean put on screws of the back) and ready for another 10 years. Permalink Submitted by Mary (not verified) on Sun, 2009-09-20 11:19. Thank you for sharing this information! My DH had taken his Casio watch to WalMart (where we had purchased it) to get the battery replaced. Couldn't, didn't, etc. I called to ask WM some information and was told Casio won't let them replace batteries (our Target doesn't even sell watch batteries, any longer). Also, I was told that the WM clerk should have given him a box, so he could send it back to Casio. After reading your page, I was able to buy a package of two batteries for just over $4 at WalMart. Following your photo and directions, he was then able to easily replace the battery. (His watch hadn't quit running; but, the alarm had ceased working and the light no longer worked.) Again, thanks for sharing! Permalink Submitted by Tristan B (not verified) on Mon, 2009-10-26 03:54. Thanks to your page, I saved my precious '87 Casio FL-70 that had stopped beeping.. I just brushed the piezometer on the metallic cover of the watch with metallic wool (it was grey after more than 20 years of oxidizing...), and the watch beeps now as a charm ! Permalink Submitted by Anonymous (not verified) on Wed, 2009-10-28 04:07.